A large capacity case built with space to organize, store and transport your medical supplies. From vaccination providers to emergency responders, the adaptability of this case is appreciated. Alphanumeric identification is complimentary. 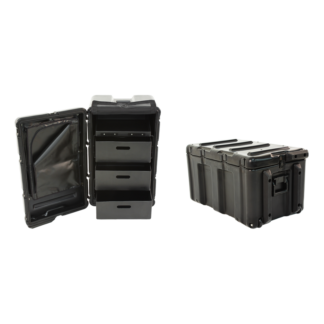 A durable 3-drawer case built to keep lifesaving equipment and supplies organized, secure and clean. This case converts from a storage container to a medical cabinet in seconds and is airtight making it ideal for emergency preparedness supplies. The Wheeled Medical Case (MC-1) is a large capacity case for medical supply organization. Latches keep contents secure during transport, while locks and a key keep items safe during storage. The removable tray is just the right size to organize smaller items. Pack it up and be ready to respond. It features an enormous compartment, wide, heavy-duty rubber-coated wheels, a large pull-out steel handle, and complimentary alphanumeric identification labeling. 50 gallon capacity capable of hauling 110 lbs.